The Charsoon Antimatter 300W charger is a powerful charger for its size. This high power balancing charger/discharger can provide up to 20A charge rates and handle up to 6S Li-po/LiFe or 17S NiCd/NiMH battery. 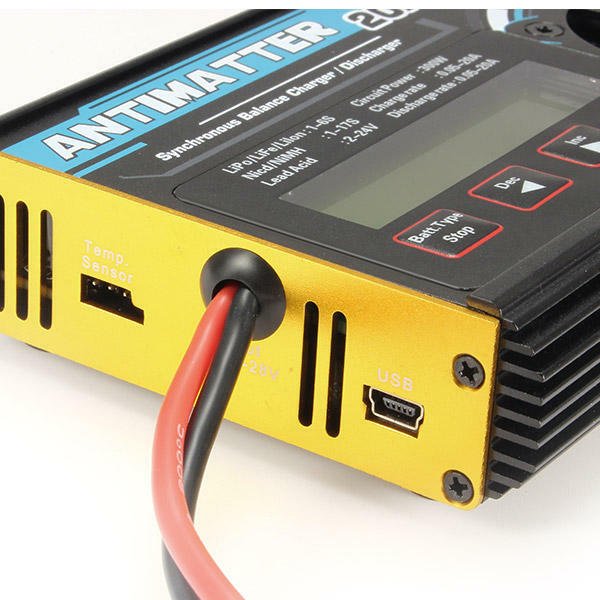 The Charsoon Antimatter 300W has great features such as storage charging, cyclic charging / discharging, 10 charge parameter memory and can also be set up as a convenient power supply for a hot wire foam cutter. 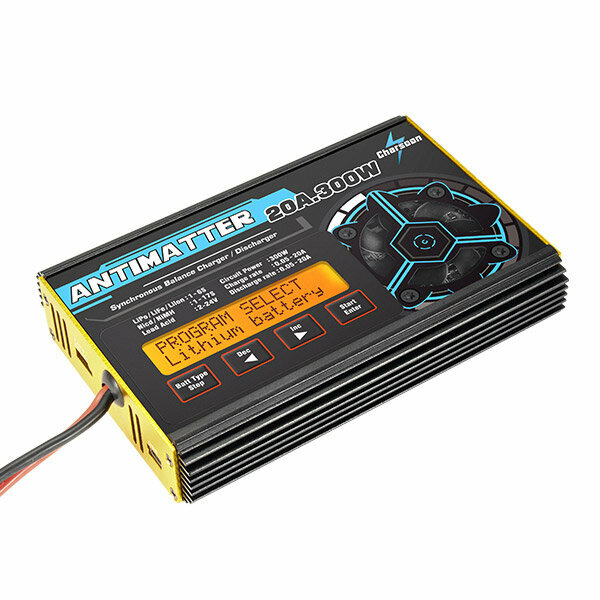 The charger can be used with Lipo,Lilo,LiFe,Ni-Cd,NiMH and Pb battery. For lithium batteries: balance charging,normal charging,fast charging,storage,discharging,ext-discharging,charge/discharge cycling and battery monitoring. For NiCd/NiMH batteries: charging-auto,charging-manual,discharging,charge/discharge cycling and forming charge. For Pb batteries: charging and discharging. When you connect the external capacity resistance,you can use it as the maximum discharge power capacity - 600W(30V/20A). When you use other equipment to charge or discharge a Lithium pack,you can use the charger to monitor the per-cell voltages,battery temperature and process time. If any individual cell appears over-charged or over-discharged or the pack is too hot or the process has gone on for too long,the charge will generate an alarm sound and the related information will blink. In this mode,the charge acts as a convenient power supply for a hot wire foam cutter. The charger can not only measure the internal resistance of the battery pack,and also can measure the per-cell internal resistance (only available for lithium battery). The charger has protection for reversed polarity(input or output),low input voltage,battery temperature,charging capacity and time overrun. This mode can be used to run-in electric motors,test motor parameters and performance,check tolerances etc. The charger has a 16Mbit flash storage,which can log offline charge and discharge data in 36 hours. This charger doesn't come with the AC adapter and cord.